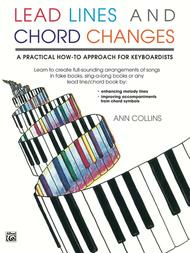 A Practical How-To Approach for Keyboardists. Composed by Ann Collins. Piano Collection; Piano Supplemental. Book. 80 pages. Alfred Music #00-199. Published by Alfred Music (AP.199). An extremely useful volume for pianists who wish to expand their skills at playing chords or reading melody lines and adding their own accompaniment. Major and minor triads, dominant 7th chords, diminished triads, augmented triads and more are all clearly explained and diagrammed.